In the warmer months in Brisbane you’ll see thousands of frangipani trees flowering across the city, and footpaths often covered in a carpet of blossoms. The most common flowers are white with a yellow centre and their sweet fragrance can – just for a moment – make you believe you’ve been magically transported to a lush, tropical resort. 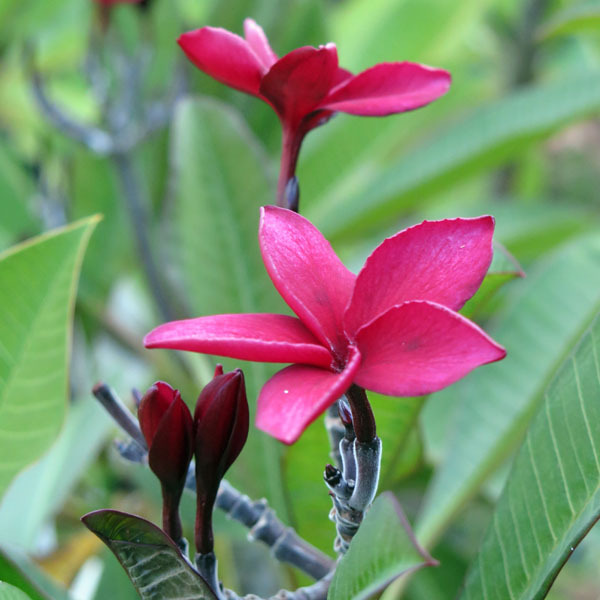 Frangipani trees are very easy to grow from cuttings. When a delivery truck collided with my neighbour’s tree, she gave me the broken branches. I put the accidental cuttings on the ground in a semi-shaded spot for about two weeks so the ends healed, and then popped them in pots. 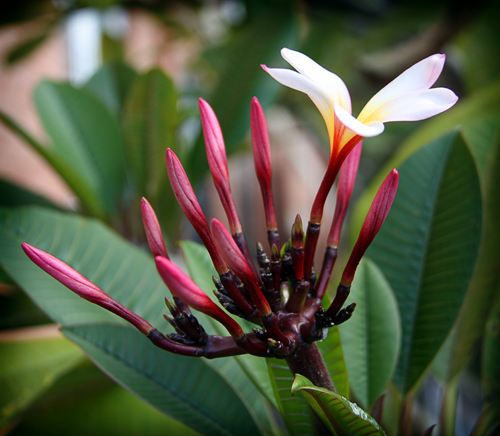 Now I have mini-frangipani trees on my veranda, but I could plant them out and they’d become trees several metres high. One of my happiest childhood memories is running, with my cousins, through a thick blanket of crunchy, brown leaves dropped by the frangipani trees on my aunty’s footpath. I’ve been enjoying this red frangipani in a pot at my front gate. It’s been flowering for months and doesn’t mind scorching sun and drying out when I forget to water it. After it drops its leaves in winter, I’ll be taking cuttings to make some new trees. It’s been a few years, but I’ll be able to pay my neighbour back with a red frangipani, which hopefully won’t be hit by a truck. Parade. The Queen Street Mall was the busiest I’ve ever seen it. We were all there to see over 200 performers singing and dancing scenes from “The Nutcracker”. In amongst the human performers were camels, donkeys, sheep and two reindeer pulling Santa’s sled. We arrived 15 minutes before the 6:30pm start time and got a front row view. 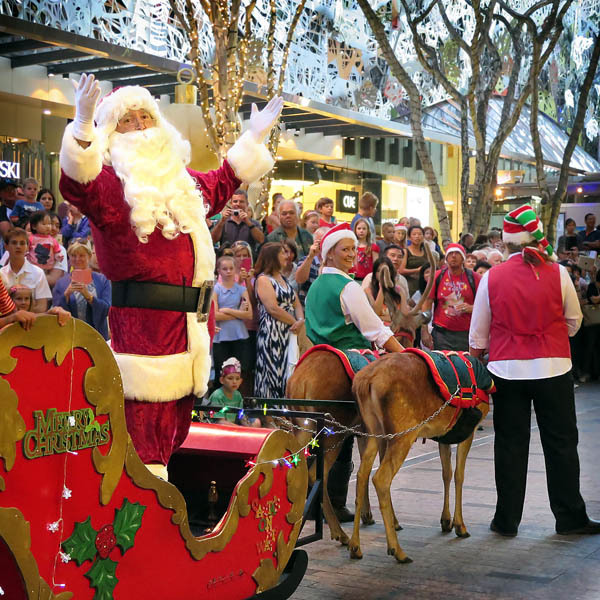 (We parked under Queens Plaza $15) The parade lead to King George Square for a free pantomime performance. 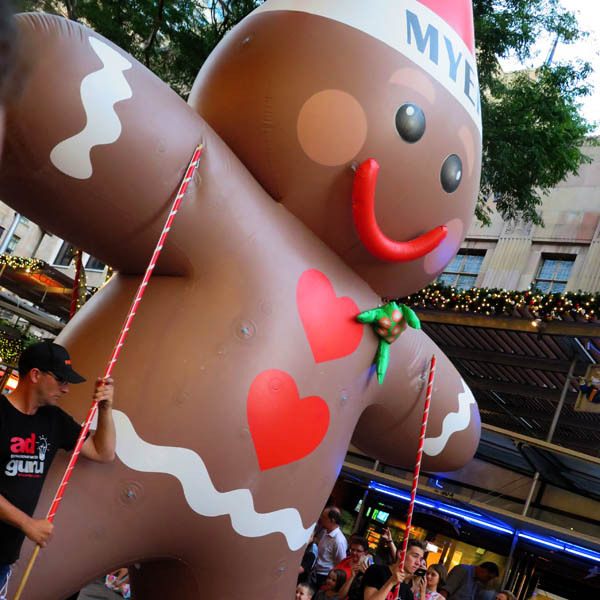 On the way, we detoured to have a look in the Myer windows which this year, were themed around the story of the Gingerbread Man. 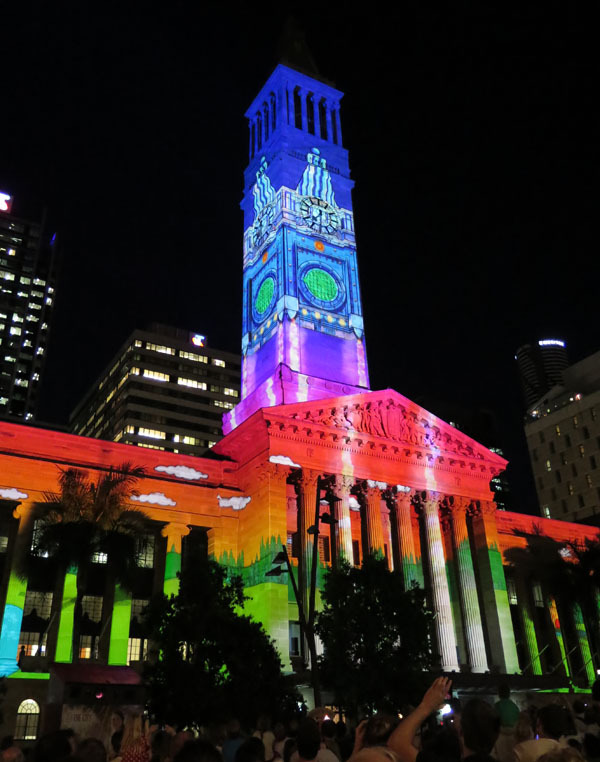 After the pantomime, Brisbane City Hall was decorated with the most impressive light show. 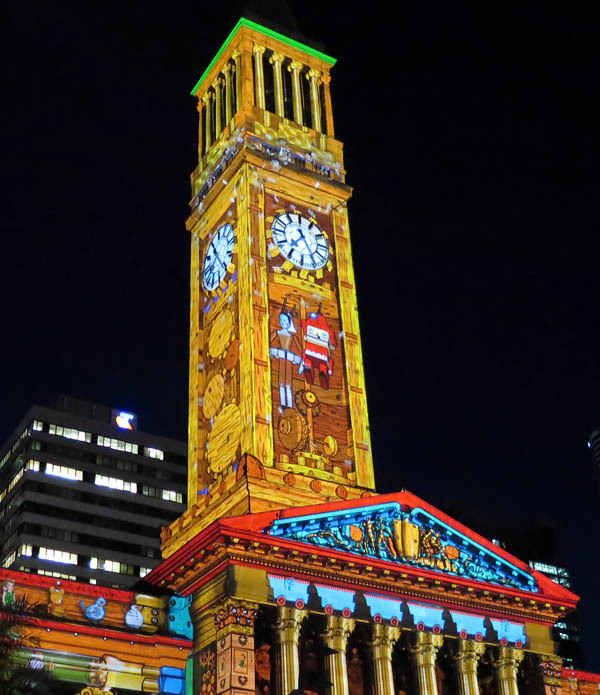 It wasn’t just lights, but a giant animation projected onto the historic building. I could have watched it three times because there was so much going on when City Hall was transformed into a clockwork Christmas toy factory. It’s hard to imagine that the building’s columns could be transformed into pistons. In the end, the clock tower becomes a giant rocket which shoots up into the sky. See the YouTube video. This magical spectacle shows every 15 minutes from 7:30pm until midnight. 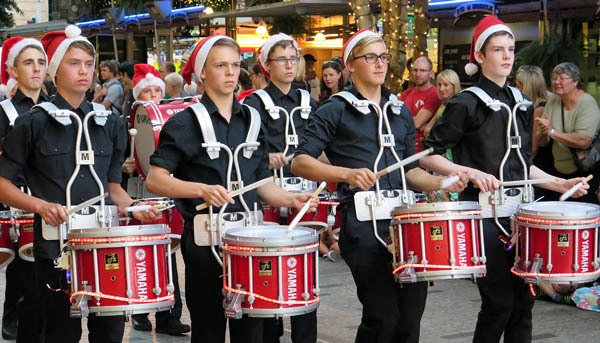 It’s definitely worth a trip into Brisbane city to see the parade and light show. I’ve been teaching crochet classes at Side Street Vintage for a few months now. (It’s nice to use a part of my brain that I don’t use when writing books.) Crochet is so popular, for our beginner classes, we often have to put on extra teachers. I love teaching beginners. 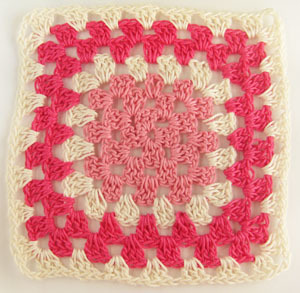 In one session we can usually take newbie crocheters from a basic chain stitch to making their first granny square. Every second Wednesday evening is Stitch Club. Everyone brings along their current project, which might be crochet, knitting, sewing or embroidery and we craft and chat. It reminds me of a scene from a Jane Austen novel with all of the ladies sitting in a charming parlour sipping hot drinks and talking about Mr Darcy. Last week, one of the lovely crocheters brought along a plate of freshly baked jam drops. Love my job! There are classes for complete beginners and more advanced lessons where you can learn to how to, for example, create a rug or crochet beautiful flowers. Take a look at Side Street Vintage’s Facebook page for the latest schedule. 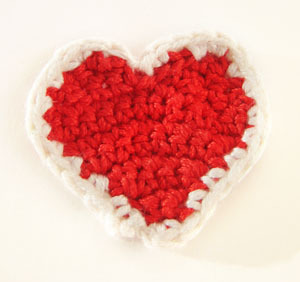 Did you know that celebrities such as Meryl Streep, Eva Longoria and Catherine Zeta-Jones are crocheters? You can read about others at CrochetwithDee. Like many parents, I’ve been looking for child-friendly, free things to do during the Christmas school holidays. Oh yes, and it has to be air-conditioned or at least have a cooling breeze. Brisbane’s Gallery of Modern Art fits the bill perfectly. 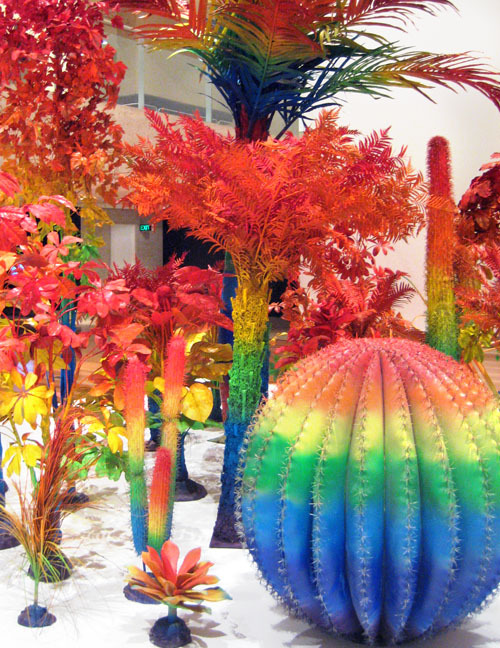 GoMA is a great spot to take kids at the moment because the Asia Pacific Triennial of Contemporary Art is on (until 14 April 2013). There’s plenty of hands-on activities for children. It’s a good idea to head in early (10am week days & 9am weekends) before the queues, and go straight to the Kids’ APT area. The two boys, aged 7 and 8, we went with enjoyed posing for photos in front of giant images from Kazakhstan. You can email the resulting photos to yourself. They also made animal animations using Farsi script. Again you can email these to yourself. The ceiling and walls of the Paramodel room are covered with model train tracks and snow-capped mountains. On the floor, children can make their own constructions using bright blue train tracks. Despite having plenty of train track materials at home, the boys we accompanied spent a very long time in this room, working with other children to create a complex network. Other people’s toys are always more interesting aren’t they. Fortunately there are a few comfy seats nearby. We took a break for early lunch at GoMA’s Cafe Bistro which has a lovely open grassy area, perfect for families. We’d brought some drinks and snacks for the kids which they had sitting on the lawn. We adults sat at an outdoor table and had a light lunch but the boys were still hungry after all of that construction, and shared a pizza from the kids’ menu. Also sharing the lawn is the new giant elephant sculpture. Another nice eatery nearby with an outdoor area is the Queensland Art Gallery’s QAG Cafe. It’s right next to the water mall and sculpture garden which the boys enjoyed exploring while we had a quiet coffee later in the day. 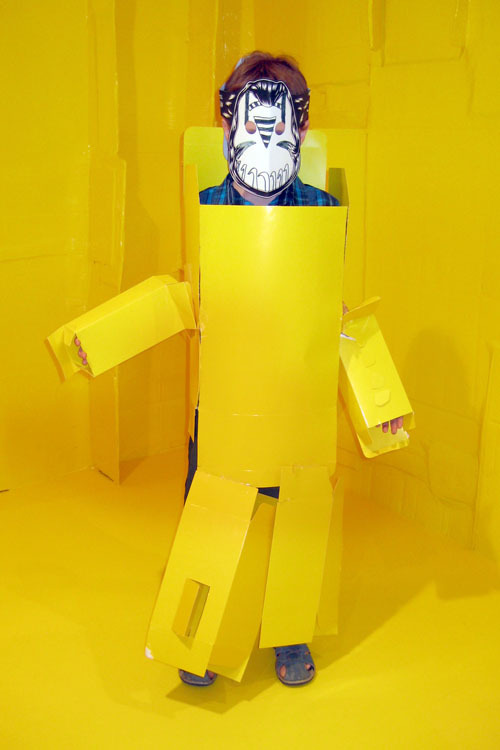 Apart from the children’s areas, there are plenty of artworks in the other areas which will interest young children. The exhibition continues at the Queensland Art Gallery which is one minute’s walk away. The boys liked the giant metallic snake skeleton hanging over the water mall. We ended up spending over five hours in the galleries, but if you can handle more, between the two galleries is the State Library of Queensland which has even more school holiday activities. And yes, it’s air-conditioned. It’s around November that Brisbane turns a bright red/orange with the flowering of thousands of Poinciana trees across the city. These trees are from Madagascar and Brisbanites know the flowers mark the start of the summer heat and hopefully some rain storms to cool us all down. They do take a long time to mature enough to flower, sometimes a decade. We have one on our footpath that’s a bit over ten years old and it finally flowered last year. Children love the dried, dark brown seed pods from Poincianas because they make a wonderful rattling sound when you shake them. This is a popular surfing spot, but if the waves are too big, there’s a salt water pool at the end of the beach which has sun shades and shallow areas for little children. There’s also a great play area with fountains that shoot out of the ground, up behind the beach. A very popular beach which is right behind Noosa’s glamour strip of Hastings Street, I have honestly seen beautiful young women wearing gold bikinis and high heels here. However, there are also lots of families and slightly less glamorous mummies like myself (okay, a lot less glamorous) enjoying the waves. 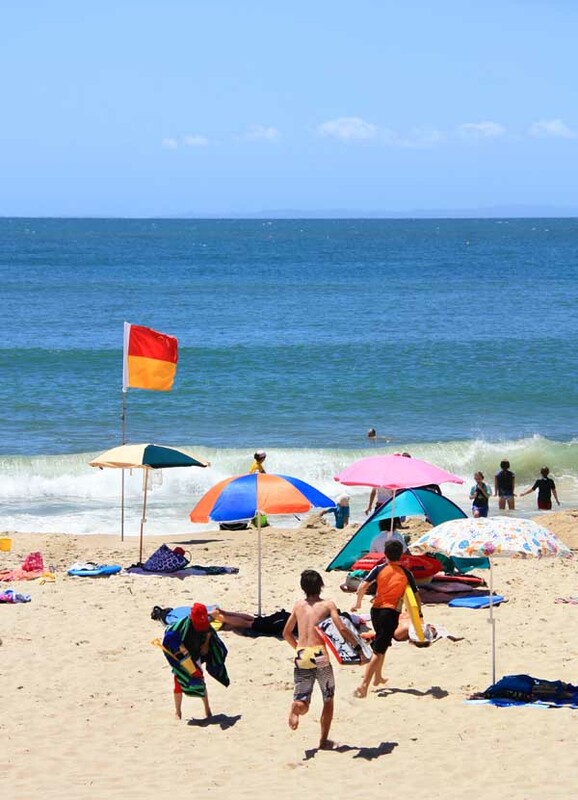 If you need a break from the waves, there are the shops and cafes of Hastings Street to explore, or you can take a walk in nearby Noosa National park which has spectacular coastal views. 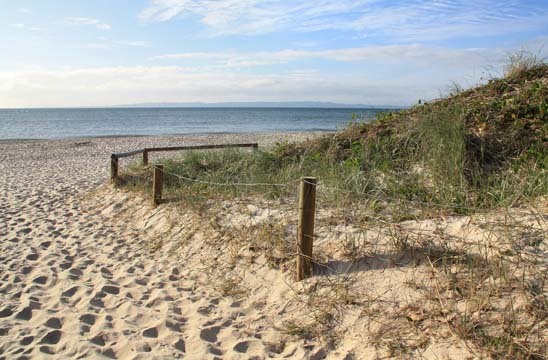 Bribie Island is only an hour’s drive from Brisbane, but you really feel like you’re on holiday when you drive over the bridge which links the island to the mainland. The pace is slower on the island and the atmosphere is more relaxed than the more developed coastal areas to the north. There are sheltered beaches on the bridge side. They’re great for really little kids who can make sandcastles without having them washed away by waves. There’s also plenty of shade and picnic shelters behind the beach. Every time we’ve spent some time sitting on the beach near the Bongaree jetty, we’ve seen dolphins cruising by, just off the beach. If you want some surf (don’t expect big waves), head directly across the island to Woorim. The beach is patrolled by lifesavers (and the surf livesaving club has good food). There are beautiful parklands behind the beach with picnic shelters and playgrounds. We’ve stayed on Bribie for a few days and found it really relaxing. There’s a bike path right across the island, and it’s flat so even young riders will manage the trip. We stayed at Aquatic Vista Apartments on the Pumicestone Passage/bridge side of the island. The apartments are all new and shiny and you can walk everywhere. The people running it were super friendly and helpful. 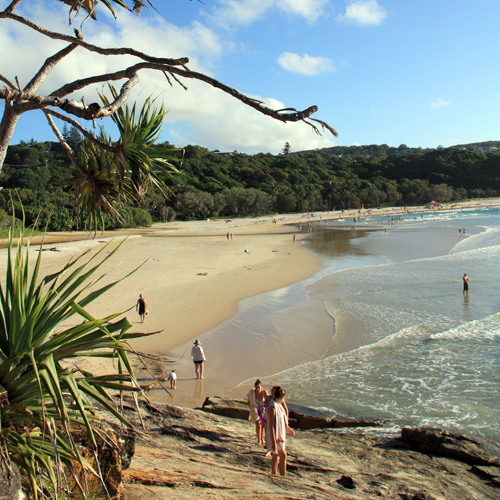 Cylinder Beach is one of our all time favourite beaches, probably because we love visiting Stradbroke Island ‘Straddie’ so much. Sometimes you can get a good wave at Cylinder, but at other times it can be pretty flat. If you’re after a wave, Straddie’s Main Beach around the corner is usually pumping when Cylinder is quiet, although I find it a bit too rough for small children. During the whale migration season, we’ve seen whales leaping about, just off Cylinder Beach and if you’re on the beach just after sunrise, it’s not unusual to spot a pod of dolphins. I’ve taken my kayak out and had them swim right up beside me. If you don’t have time to travel to one of the coastal beaches, there’s a beach right in the city, in the South Bank Parklands. We love having an evening swim at Streets Beach and you can watch the city lights across the river. A word of warning: the lovely aromas coming from nearby BBQs and restaurants get your appetite going. Right beside the beach is Aquativity, a water play area for children. 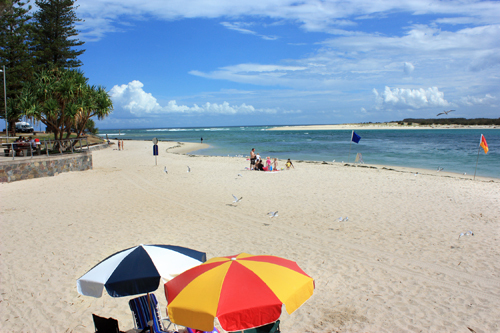 Do you have a favourite beach near Brisbane? The folks in the beautiful mountain village of Leura, in Australia’s Blue Mountains, understand just how exhausting shopping can be for men.